Successfully Added Multi-Color Rainbow Illumination Egg to your Shopping Cart. Multi-color Rainbow Illumination Egg. 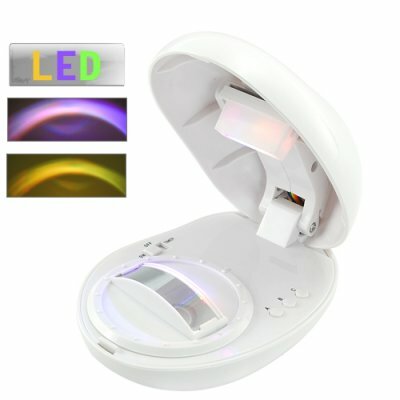 A fun nighttime color effect lighting projector for putting color rainbows in a bedroom or wherever you want an interesting night light. Everyone loves rainbows, right? Well, now you can see a rainbow every night with our exclusive Multi-color Rainbow Illumination Egg. If your young children have trouble going to sleep at night in the dark, then give them a colorful companion that is safe and comforting. How does it work? Simply place the Multi-color Rainbow Illumination Egg on a shelf or desk and face it at the nearest wall. Then wait until night and then turn it on to enjoy the show! The Multi-color Rainbow Illumination Egg is really much more than a nightlight. With this unit you can run it in either a timer mode so it lasts for 60 minutes and then automatically shuts off or use the standard mode and let it run all night. In addition, it has three rainbow projection types (Variation, Vivid, Slow), so you can change things up every night! A wonderful gift for the young child or anyone who just does not feel comfortable without a nightlight nearby, the CVFW-G154 is another in our selection of one of a kind items we are proud to offer to our exclusive customers and retail partners. Destined to be a top seller, order your stock right now to be ready for the upcoming holiday season. Is this only for children? People of any age can enjoy it, but young kids will get the most enjoyment from it. Can I hang this on my wall? No, this should only be mounted on a flat horizontal surface like a shelf, desk or table. Not recommended since this unit is not waterproof.